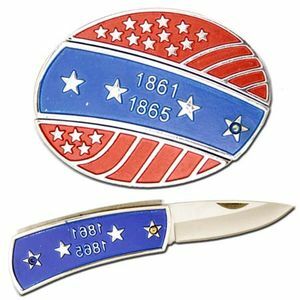 Hidden Belt Buckle Knife with civil war years in red and blue with silver stars monogram. 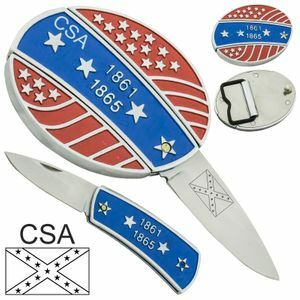 Heavyweight brass buckle with slot concealing folding knife with 2.25 inch stainless steel blade. Right handed pull to remove blade from buckle. Buckle is 3 inches wide and 2.25 inches tall. Nice detail stars and years in relief. Cannot ship to NY or CA.